The slimline design of the Mariposa Club Sofa and Armchair (2017) by Edward Barber and Jay Osgerby offers maximum seating comfort, while the compact dimensions take up limited space. The Mariposa family of sofas exudes an invitingly cosy feel with a modern touch. In collaboration with Edward Barber and Jay Osgerby, Vitra has now expanded the collection with new variations: the Mariposa Club Sofa and the Mariposa Club Armchair. Both pieces are suitable for high-quality, compact urban living spaces and for use in lounge and hospitality settings. The slimline body of both the sofa and armchair offers maximum seating comfort, while the compact dimensions take up limited space. The Mariposa Club epitomises a design philosophy that seeks quality and expressive flair in a condensed format. Unlike the other sofas of the Mariposa family, the Mariposa Club Sofa and Mariposa Club Armchair do not have adjustable side and backrests. 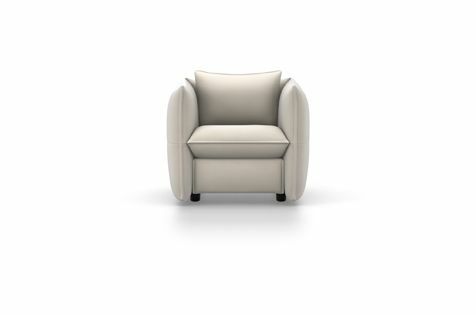 However, despite smaller dimensions, both pieces follow the design of their larger counterparts, offering pleasantly soft upholstery and a high degree of comfort. Their covers come in a wide selection of colours and fabrics, allowing for numerous individualisation options. The Mariposa family is complemented by two round ottomans of different sizes that also match the soft contours of the Mariposa Club Sofa and Armchairs. Seat Cushion Description: webbed metal frame with polyurethane foam. Glides Description: plastic glides with levelling adjustment.